Army of Two: The Devil's Cartel drifts in a Lagrangian point of video game mediocrity. No force pulls it toward being a contemptible or even bad effort, but nothing budges it into the orbit of entertainment, even as a guilty pleasure, either. Its experiences are the most indistinct I've ever had in the wide world of shooters, whether third person or first, to the point I can't even call the game derivative, because I'm not sure from what it is specifically derived, other than a bad action movie aired on a UHF station on a Saturday afternoon. Army of Two is a photocopy of a photocopy of a photocopy of a funny picture that lost all of its humor in the process. The game is simply bereft of purpose. 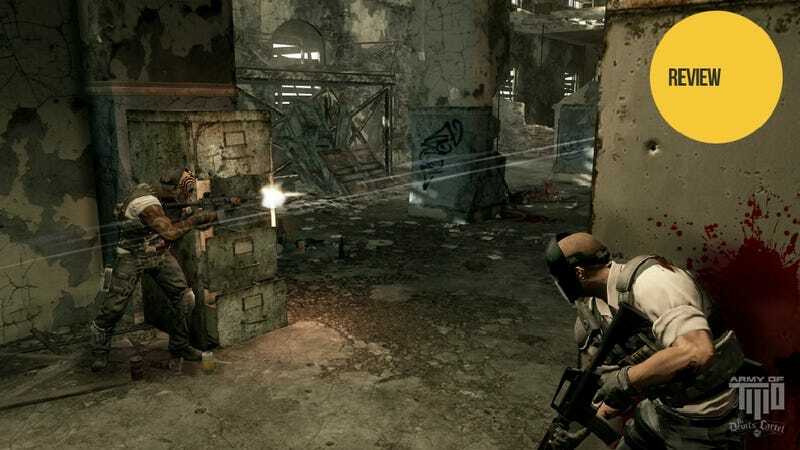 There's nothing in Army of Two: The Devil's Cartel that can't be experienced in some other shooter—from the bullet-time super mode to a superfluous extrasensory view of the battlefield, to the disposable D-pad tactical commands. The ostensible reason this franchise even exists—cooperative play—is undone by a hamfisted implementation that requires both human partners to complete an entire chapter together, start to finish. If someone wants to join your mission, you must restart it. If they leave it before completion, you restart it. There is no true drop-in/drop-out, by now a basic expectation of cooperative multiplayer. Army of Two's failure to deliver this is its most damning shortcoming, much less forgivable than the rote dialogue and cookie-cutter weapons and their upgrades. The rigid cooperative multiplayer (there is no competitive multiplayer) leads to a strange cost-benefit analysis when you're looking to team up with someone you don't know. (Trying to invite a human player to a private match was difficult enough as it was.) No one flaked on me in two dozen online missions, but there was a palpable obligation to not cue up the next one unless I was fully prepared to go to the end. Likewise, I hoped that the obviously higher level partners who came to my match wouldn't get bored and cut out. I refused several join requests that arrived in the middle of a mission (or what I judged to be its middle, some are incredibly short) because there's no real advantage to working with humans and coordinating tactics by voice. On standard difficulty you can plow through most levels with a bot partner while barely genuflecting to flanking tactics, much less cover fire or decoy maneuvers. By the final third of the game you'll be sick of two-man breach maneuvers, pushing trucks and air conditioning units to provide cover, and pouring lead into helmeted "brutes." As my three favorite titles currently are two sports games and an MMO, I'm extremely tolerant of repetitive gameplay, because the larger context is at least interesting to me. Army of Two's paper-thin premise and anonymous protagonists (their names are Alpha and Bravo, which should tell you a lot about their personalities) supplies none of that. Neither character leads the conversation, much less the battle. A bot Bravo is as capable of cleaning up the battlefield as you are, if you let him. We're promised "over-the-top" action, but what I saw was more gratuitously violent than it was any kind of parody, intentional or otherwise, of action movie tropes. About the most over-the-top it gets is when you trigger the game's Overkill modes—one affects you only, another comes when both players fill up a meter and trigger it together. The game slows down, both players go immortal, ammunition is set to unlimited, and you rain destruction down on the hapless, generic idiots running this cartel you're tasked with dismantling. Still, if there is over-the-top action to be found in such an uber-mode, it's all on you to create it. The weapons you're given all perform roughly equivalently within their class, even when upgraded, and you're rarely confronted with a sequence in which you need to think about the loadout you're carrying (you have two weapons and a sidearm, choosing from an assault rifle, a shotgun, an SMG, a squad assault weapon, a sniper and a pistol.) If you absolutely need a sniper for a specific mission one will be presented to you as a gun mount. Weapon upgrade then becomes a matter of aesthetic choice rather than strategic necessity, another wasted opportunity for this game to distinguish itself. The game does have brief flashes of excitement: A high-speed getaway in a van that barely crosses the finish line intact was, admittedly, a satisfying thrill ride. It ends with a freight train annihilating your pursuer, about the closest the game comes to delivering that over-the-top promise. Set pieces involving machine gun emplacements, whether operating or flanking them, provide a solid payoff in ground combat. Yet Army of Two: The Devil's Cartel has that unmistakable odor of a game borne to greater ambition, and somewhere up the food chain funding for that ambition was cut. Indeed, Electronic Arts' decisions to shut down the studio that made the game, and then not send out review copies of the game until the day it went on sale, speak of a publisher with zero faith in what it is selling. Army of Two: The Devil's Cartel isn't good game. Yet it isn't really even a bad game, either. It's simply a game whose lack of a compelling reason to be played speaks to the absence of any compelling reason for it to be made.